British renku master, John Carley, who died on 31 December 2013, is commemorated in a new page here on the Icebox: “Memorial kasen for John Carley”. Please click this https://hailhaiku.wordpress.com/memorial-kasen-for-john-carley/ to read the linked verse composed by 10 international poets led by Eiko Yachimoto using a haiku of John’s as its lead verse. If you have any comments, you can either leave them beneath this announcement or at the foot of the kasen page itself. Enjoy it, please! 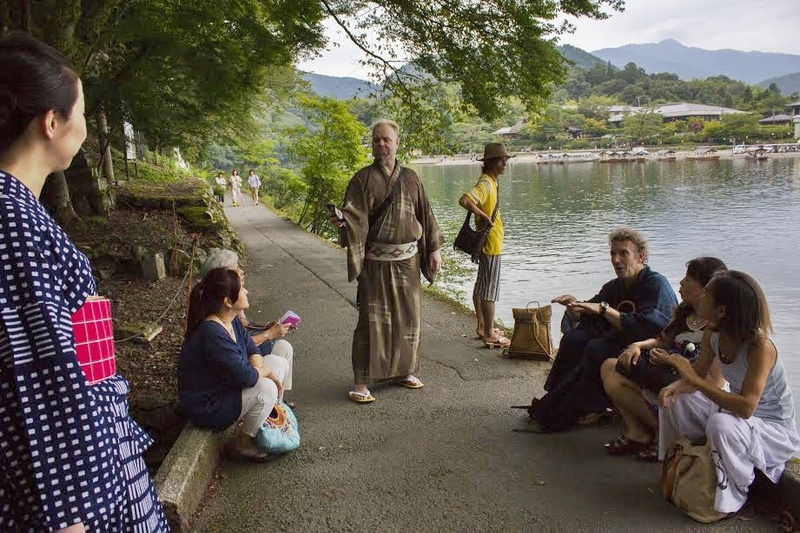 As its last event of the summer, Hailstone Haiku Circle held a ginko-no-rengakai (‘stroll and scroll event’) at Arashiyama on Daimonji Night, 16.8.15. Sixteen attended. 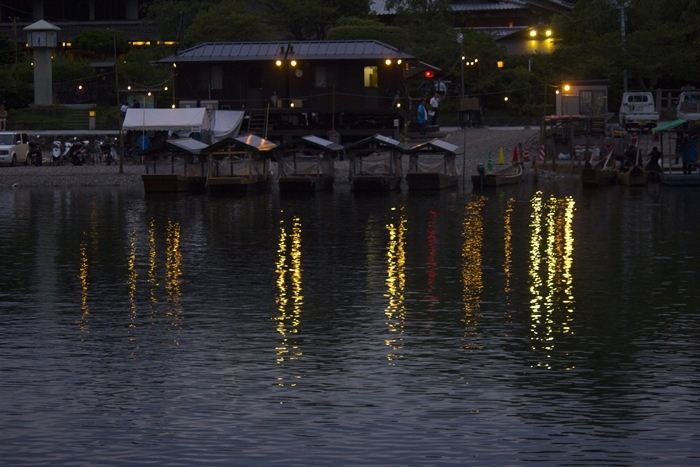 On this, the last day of the O-bon season, multiple bonfires are lit on the hills around Kyoto as a way of seeing off the spirits of the dead who are thought to have been invisible guests in the homes of relatives these past few days. The first fire to be lit, and the largest, is shaped like the Chinese character for ‘big’ and dominates the eastern side of town; the last, overlooking Kyoto’s western side, is shaped like the ‘torii’ or sacred gateway leading to the Fire God’s shrine atop Mt. Atago, which is ‘the mountain’ alluded to in the hokku (first verse) here. The ageku (final verse) thus links back to the hokku. We climbed the steps up to Hōrinji Temple to get a better view of the bonfires. Rain is mentioned once, and once only, as it turned out to be but a heavy shower. Ken Jones gave a reading to Hailstone 12 years ago in Osaka and news of his passing had just reached us. On the night he was in the sabaki’s mind. This linked verse is what we managed to get down. Each verse has become a picture in a kaleidoscopic narrative poem. (Tito) ….. ….. ….. …..
(Peter) ….. ….. ….. …..
(Masako) ….. ….. ….. …..
(Eiko) ….. ….. ….. …..
(Tomoko) ….. ….. ….. …..
(Takeshi) ….. ….. ….. …..
(Mika) ….. ….. ….. …..
(Peter/Micah) ….. ….. ….. …..
(Hideyuki) ….. ….. ….. …..
(Kazue) ….. ….. ….. …..
(Hiroko) ….. ….. ….. …..
A shisan renku consisting of twelve verses that follow the progress of the seasons: 春-夏-秋-冬. This linked verse, the last in our Four Seasons series, was composed on 3 May ’13 in a roof-top tearoom (川 Sen) at the Tatsumi Building near Kyoto Station on a bright and breezy spring day. As we worked, we enjoyed a sample of rare imported teas and took lunch outside on the patio roof with its views of Mts. Hiei and Atago. Ten poets took part and most had at least one of their offered verses chosen. fabric of a linked verse. participants (in random order): Ursula Maierl (sabaki), Tito (shuhitsu and host), Hitomi Suzuki, Peter MacIntosh, Haruka Hasaba, Toshi Ida, Kyoko Nozaki, Mayumi Kawaharada, Keiko Okumoto and Richard Steiner. A shisan renku consisting of twelve verses that follow the progress of the seasons: -冬-春-夏-秋. The linked verse was composed on 24.2.13 in an 8-mat room upstairs at Murin-an 無鄰菴, Okazaki, Kyoto on a bitterly cold late winter day of sun and passing snow flurries. 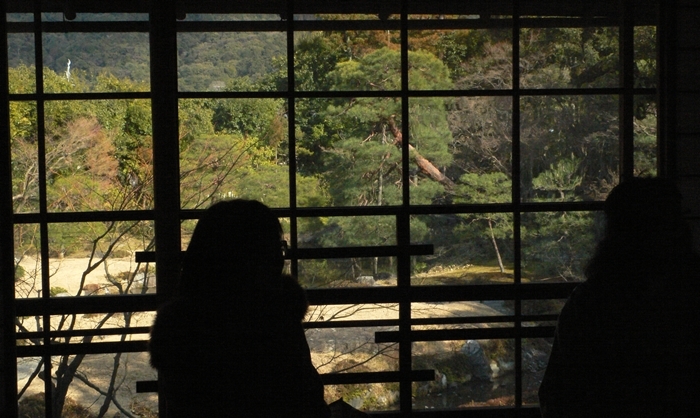 Some enjoyed a stroll around the watery, Meiji-period landscape garden we could see from the window. Twelve poets took part and most had at least one of their offered verses chosen. A shisan renku, consisting of twelve verses that follow, through the process of shift-and-link, the progress of the seasons: 秋冬春夏. 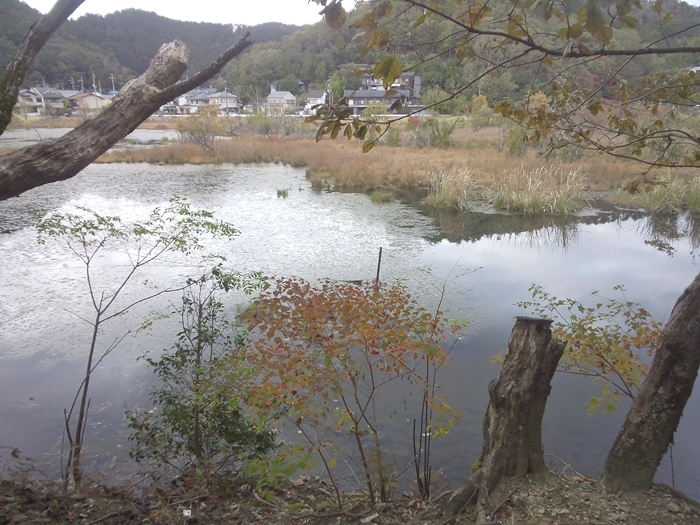 The linked verse was composed on 4 Nov. in an 8-mat tea-room at Yasui Kompira Jinja Kaikan on a fine, still autumn day, which included a lunchtime stroll to the Kamo River in eastern Kyoto. Eleven poets took part and most had at least one of their offered verses chosen. The ‘tallow leaves’ are those of the ナンキンハゼ nankinhaze tree (candleberry). Subhadassi, a visiting British artist with a passion for renga, had visited Mt. Ogura the previous day. 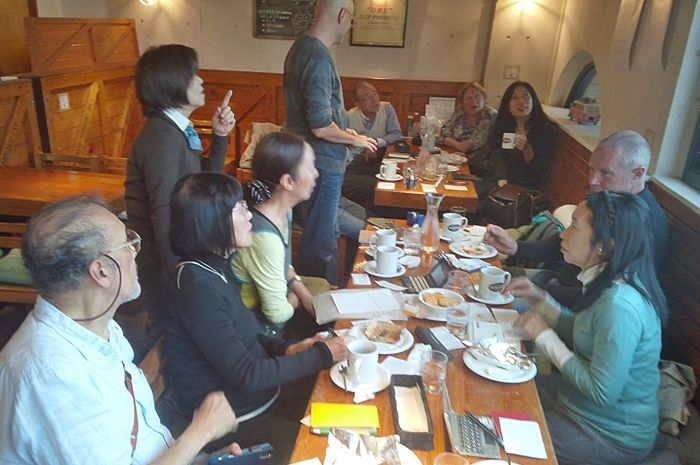 participants (not in order of their contributions): Subhadassi (sabaki), Tito (shuhitsu), Mayumi Kawaharada (host), Jiko, Mari Kawaguchi, Hisashi Miyazaki, Ursula Maierl, Gerald Staggers, Kittredge Stephenson, Masako Fujie and Peter MacIntosh.